An inspiring and intriguing book on dimensions is “Flatland - A Romancy of Many Dimensions” by Edwin A. Abbott. In this satirical novel, Abbott describes different dimensional worlds from the point of view of A. Square, who is living in the two-dimensionalworld called Flatland. The Square dreams about a visit to a one-dimensional world (Lineland) inhabited by Points. He attempts to convince them of the existence of a second dimension, but is unable to do so. When A. Square is visited by a Sphere (from Spaceland), he cannot comprehend this third dimension until he sees Spaceland for himself. After the Square’s mind is opened to new dimensions, he tries to convince the Sphere of the theoretical possibility of the existence of a fourth (and fifth, and sixth, . . .) spatial dimension, but the Sphere returns his student to Flatland in disgrace. The Square recognizes the identity of the ignorance of the inhabitants of Pointland and Lineland with his own (and the Sphere’s) previous ignorance of the existence of higher dimensions. The link between Flatland and this thesis is the concept of dimensions. Many dimensions exist in the world of financial markets, much more than we can comprehend as inhabitants of our three-dimensional world. As I will outline below, many dimensions in financial markets remain uninvestigated. The two that have the main focus in this thesis are the dimensions of liquidity in the equities market and the term-structure dimension in the commodities market. Both are not yet explored to their full extent. Besides this direct link there is another link between the book, Flatland, and this thesis. The essential message of the book is that we should “open our mind to new ideas”, which is very similar to the journey of a PhD student. We should explore fields that we have not done before and we should be receptive to things that baffle us at first thought. The goal of this thesis is to present frameworks that shed more light on the mentioned dimensions and to use the new findings and insights in ways that are relevant from both an academic and practical point of view. The thesis consists of two parts. 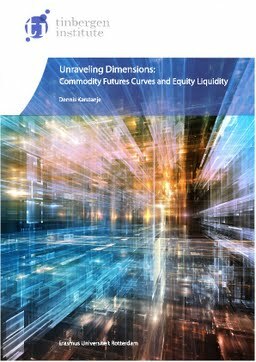 In the first part liquidity is at the center stage, while in the second part we focus on the term structure dimension in commodity futures. Note This book is no. 606 of the Tinbergen Institute Research Series, established through cooperation between Thela Thesis and the Tinbergen Institute.